215, 000 tonnes of second hand consumer electronics, mainly from Western Europe and the US, come through Ghana a year. It is a hot sunny day, but it's hard to catch rays of sunlight from the smog hanging over the world's largest digital dumping ground. A former wetland located in the suburbs of the Ghanaian capital, Accra, this is allegedly the centre of an illegal exportation network for the dumping of outdated, broken and unusable products from Western nations. "Agbogbloshie is not a nice place, " says my taxi driver, who drove me to the site last week during my week-long visit. "We nickname it Sodom and Gomorrah, the two condemned cities in the Bible. It is a very big waste site, where people work amidst black smoke and bad smell from the rubbish." 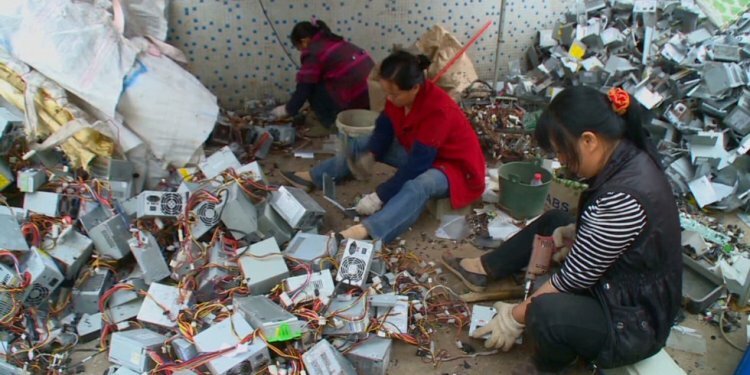 Despite the Basel Convention, an international treaty that came into effect in 1989 forbidding developed nations from carrying out unauthorised dumping of e-waste in less developed countries, demand to purchase gold and copper from vintage devices continues in Agbogbloshie. Twenty miles away in Tema Port, 215, 000 tonnes of second hand consumer electronics from mainly Western Europe and the United States still come through Ghana annually. These defunct products then get dumped at waste sites like Agbogbloshie, generating 129, 000 tons of e-waste every year. The Ghanaian government implemented a ban in January 2013 on the importation of second hand fridges because of the dangerous chlorofluorocarbon gas inside them, which has resulted in the confiscation and dismantling of British imports. However, Agbogbloshie continues to serve 40, 000 people, who earn to .50 a day for their hard labour. These men are extracting circuit boards from a pile of photocopying machines to salvage computer chips. Scrap workers at Ghana's Agbogbloshie, the world's largest electronic waste site, are taking a break from extracting copper and other sellable metals from unwanted devices. Hungry after burning a mountain of abandoned computers, photocopiers, phones, and televisions, they've just finished eating bananas delivered by the women of the site. The majority of those at Agbogbloshie are men from northern Ghana, who work at the site for three to five months at a time before they return to their families for a month to deliver their earnings. They live near the site and arrive as early as 5AM, in time for morning prayers, as they practice Islam. Designated spaces for prayer are built across the site. Prayer mats are kept away from the soil and water soaking in high concentrations of lead, mercury, thallium, hydrogen cyanide, dioxin, and brominated flame retardant generated from fumes of burning debris. Young teenage boys who would normally be starting secondary school can be found here working instead of pursuing their education. Some of the scrap workers occasionally bring their family members, including these young daughters who hang around waiting for their father to finish his day. Agbogbloshie is also a magnet for migrants across West Africa. With local and Chinese manufacturers buying the commodities, finding scraps offers them an income stream they can't get back home. As a solution to combat homelessness, the migrants build shacks on site from various items that have landed there. They take the best materials for themselves before it ends up in the hands of a buyer. They also dress themselves in clothing they have found in the rubbish. As there are no cleaning facilities, the same items are worn every day. These men hailing from Niger, Burkina Faso, Ivory Coast, and Mali, speak broken French, and Hausa between them. The feeling is mutual; that living and working on this site "is not fair" and "Europe would be a better place" for them. Despite experiencing discrimination from the Ghanaians on the site, the migrants are proud of their strength. They say they are as "tough" as their working and living conditions. Some dig for tin cans and plastic bottles as an alternative to burning electronics, reducing their exposure to the smoke. They call themselves "scavengers, " and use long metal claws as part of their "treasure hunt." Marijuana is commonly consumed to relieve them from headaches and chest pains as a result of living amidst the emission of toxic chemicals. Many also suffer from insomnia. Children weigh up the items collected before handing the bag over to buyers (left). Women tend to stay away from manual labour at Agbogbloshie and provide food for the men. Those who join in wash trimmed plastics with dirty water available from one of the few wells on the site. The pieces are subsequently dried before they are sold to buyers who turn them into plastic bags. Auto scrap collection also occupies much of the activity on site to supplement income streams. Fine holes are cut using a flame torch to extract metals and other small sellable parts. The Odaw river marks the border of the waste site and Old Faduma slum, home to 79, 000 people who are continuously exposed to the smoke. They are at risk of catching malaria due to mosquitos and other bugs present. The UN estimates that approximately 50 million tonnes of e-waste is thrown away globally every year. Regardless of where the used electronics have come from and how they have entered into the country, many continue to depend on it as a source of income.